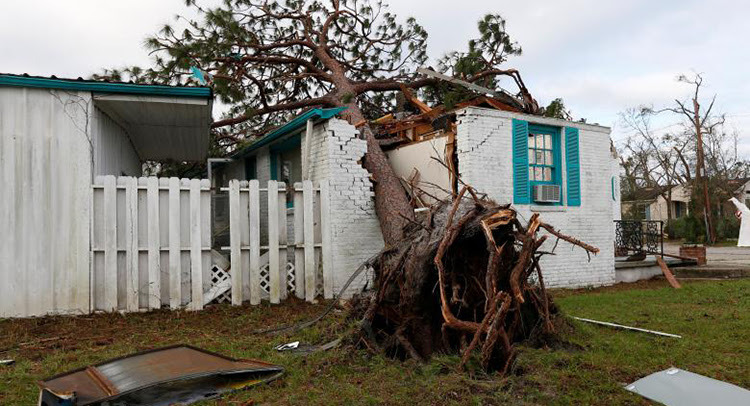 Hurricane Michael hit the Florida Panhandle Wednesday, 10 October, making landfall as the first Category 4 storm in the area in recorded history. With winds of up to 155 miles per hour (250 kilometers per hour), the hurricane was the third most powerful hurricane to ever strike the U.S. mainland. The damage was severe: more than 900,000 homes and businesses in Florida, Alabama, Georgia, and the Carolinas were without power, and many homes were ripped apart or washed away. So far, 12 deaths have been reported. The storm moved fast and intensified quickly. Although 375,000 people were ordered to evacuate, many did not have time to prepare or didn’t realize how much worse the storm would get. The towns of Panama City and Mexico Beach were especially devastated. The storm lost force quickly and has now entered the Atlantic after moving northeast as a tropical storm. The Georgia District Nazarene Disaster Response team, led by Pastor Kevin Thomas (recently returned from serving in North Carolina), is preparing a response to the town of Donalsonville, in the southwestern corner of the state. Pastor Scott Messer reported wind damage to the Donalsonville church, including the loss of the steeple, which crashed into the vestibule of the church. The church was sheltering evacuees at the time, and the community is thankful for no injuries to those in the building. This part of the state expects to be without power for three to four weeks. Many roads in Florida remain impassible, and communication is still challenging. So far, the Florida District reported damage to the building and parsonage at First Church of the Nazarene in Port St. Joe, as well as widespread loss of electricity across the most affected counties. Without permission to re-enter neighborhoods in the Florida counties of Bay, Gulf, and Franklin, most of the damage to homes and churches there is still unknown. Churches are collecting supplies to donate to the area, and Nazarene Compassionate Ministries is partnering with World Hope to deliver supplies to the affected areas via airplanes. Pastor Francisco Ayala at the Nuevo Comienzo Compassion Ministry Church of the Nazarene in Mulberry, Florida, received 1,000 Crisis Care Kits from Fawn Grove Compassionate Ministry Center for the initial response, and another several hundred kits will arrive from elsewhere in Florida.